Construction first began on the site for a railroad station in 1876, but was soon abandoned. Construction was resumed in August of 1889 utilizing and enlarging the previous foundations. The building was formally opened on September 7, 1891 by the arrival of the first train at 7;37 a.m. Total cost amounted to $310,056. At its opening it was the largest station in the south and the second largest in the west, next to Chicago. Union Station served as the great portal to the city of Louisville from its opening through the first half of the 20th century. Virtually every important visitor to the city passed through its waiting room. These included numerous Presidents and presidential candidates. One of the earliest visitors of note was Sarah Bernhardt, the famous actress, who arrived from Indianapolis on October 19, 1891. It was during construction that William Hall fell to his death from scaffolding on June 26, 1890. Another death occurred almost fifteen years later when George Warner shot and killed Pulaski Leeds in the third floor records storage room under the northwest tower that was later to become the scene of the beginning of the disastrous fire. 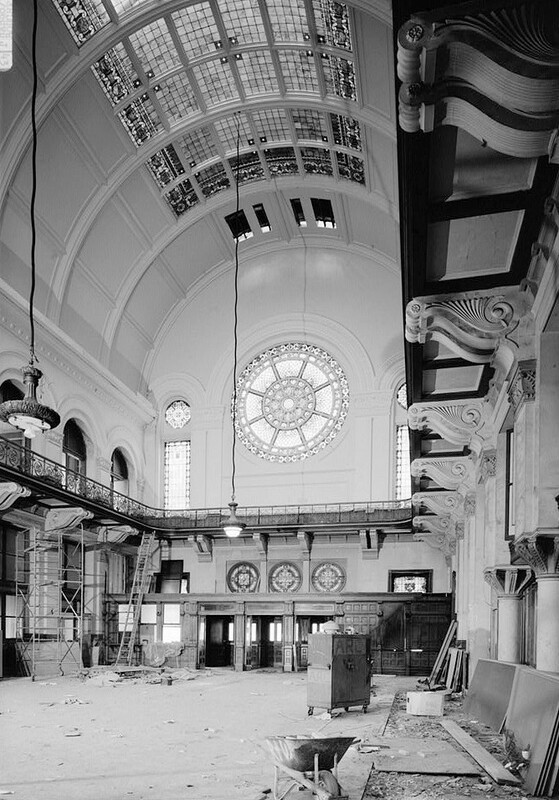 On Monday night, July 17, 1905, a tremendous fire of unknown cause broke out in the records storage room in the third floor northwest tower and completely destroyed the interior of the station. The southeast corner tower collapsed and the front wall buckled. After several weeks of discussion, it was decided to reconstruct the station as it had been. This included replacing the timber structural system rather than using a steel system which was felt to be too heavy for the weakened walls to support. The Selden-Breck Construction Company of St. Louis was general contractor for the job and the work was supervised by R.M. Cunningham. All materials and sub-contractors were of local origin except for those of the stained glass and the decorative elements. The building was virtually reconstructed as before with the exception of some changes made in the plans for offices on the third floor and the installation of new electrical fixtures. The station reopened Sunday December 3, 1905 after an amazingly short period of construction. Total cost of reconstruction was $125,000. In 1937 extensive repairs were necessitated on the main floor and basement because of the tremendous flood of that year. In 1978, when the building was sold to Transit Authority of River City, the tracks and trainsheds to the south and west of the station were removed. The stone Richardsonian Romanesque building is highlighted by a frontispiece with arches containing circular stained glass windows and flanking corbeled corner shafts resembling miniature bartizans. Pyramidal-roofed towers flank the building on north and south elevations; the east tower on the north (front) elevation contains a clock on each of its four sides. A canopy shelters the front entrance. Interesting animal grotesques on top of the corner shafts give further character to the building. Some of the rectangular windows have arches. The plan of the rear elevation is similar to that of the front elevation, with the exception of fewer windows. The interior is one open space, and its only noteworthy features are the stained glass windows, the vaulted ceiling and the second floor balconies.